Ah the unadulterated bliss of driving across the country side in a tank and shooting bad guys! Oh, and if you’ll believe it or not, I’m reviewing a World War II game! It’s been way too long since I’ve played a game set in the WWII era. Off the top of my head I can’t remember what the last one was. Either way, Panzer Tactics HD is a wild, almost “unfairly” realistic, strategy game that will have you going through the war as the Wehrmacht, the Soviet Red Army and the Western Allies. When they say that “Tactical mistakes are mercilessly exploited and punished!”, they are not kidding you. Waging war and winning isn’t as easy as one may think. Like a good action flick, everything needs to explode when it dies… everything! 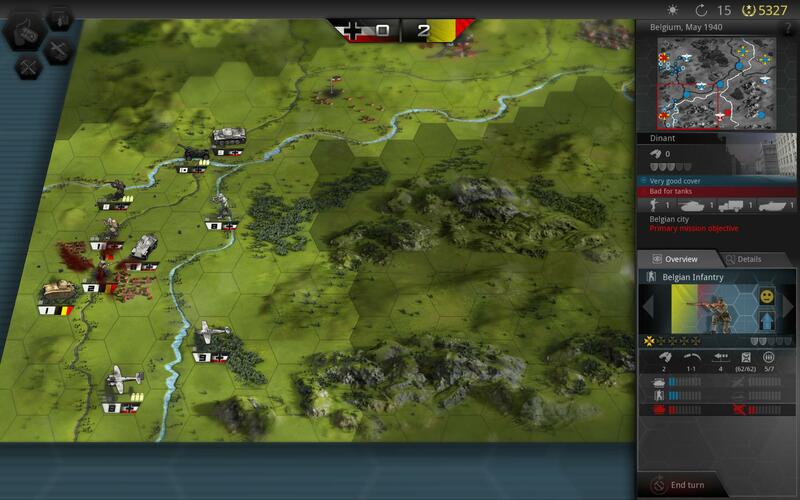 Combat in Panzer Tactics HD uses (what seems to be) RNG based attacks. At first glance there’s specific units that are stronger against others. Certain infantry are stronger against other infantry while some do more damage against tanks. Sometimes the combat seems to work out according to the given stats. However, at times the best laid plans don’t work out so well. Sometimes the enemy just laughs in your face and I can tell you, that will hurt your feelings. There aren’t really many super units to be found here (more on this later). While taking a long stroll through the country side seems like a good idea for some good intel… this is a very stupid idea. What seems like “sure bet” attacks usually leads me to blitzkrieg tactics. Massing my forces and charging in guns bared to shoot, you bet your booty I’m ready to go! That’s where the fog of war comes in. Each unit has a certain amount of distance it can see on the field. Some units can see one unit ahead, others two and that’s why I love my planes. They can fly unimaginable distances compared to everyone else and see three spaces out! I know I know, three isn’t that much farther than two, but it sure as crap feels like it when I can “park” them just a smidge away from a town or airfield and see just that much farther. The element of surprise is most of the time on the enemy’s side. Whether you’re storming a city/airport or even coming up to some trees, if you move into the fog your unit’s turn ends if you pull up beside an enemy. To add insult to injury, it always seems to be the one unit type that is strongest against yours… or that wants to act like it is. If there’s one thing I’ve learned from this game, it’s that taking over villages, no matter how small, makes me famous! 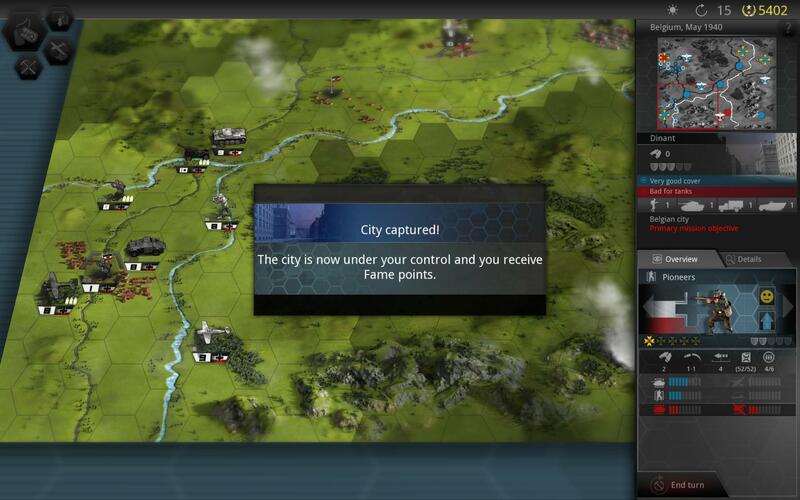 What Panzer Tactics HD does do that makes things a bit nicer/easier is that every unit can level up! To throw it out there, some units don’t seem worth the time to level up. I’d hate to say that there some units that just aren’t worth your fame (since that’s what you spend to get units). Fame is what you get for taking over places and fulfilling objectives. It doesn’t come cheap and you only get so much, so make sure you spend it on units that pack some punch. I am falling more and more in love with the long ranged artillery and AA guns. If you level those bad boys up, they can easily kill most units (that’s pretty super). The issue is moving them both as they are towed units. They can be moved manually one spot per turn which is horrendously slow. They can be towed decently far, but that counts as your move and it will sit the rest of the turn in a truck which takes much more damage than if it had been setup in the field. Luckily that goes both ways; if you see a truck, take it out (while not throwing caution to the wind of course). With over 150 different units to play with, plenty of maps to strategize on, and a level of difficulty in tactics needed to not let you walk all over this game, Panzer Tactics HD definitely has a lot going for it. It’s fun and all, but it is not an easy game. You’ll actually have to do some thinking here. I say that less to scare and more to prepare. I’m decent at planning things out when I have less choices so this game will take some major getting used to. However, it’s not going to be one that I’ve seen the last of after having written the review. It’s aggravatingly fun and I want to win! 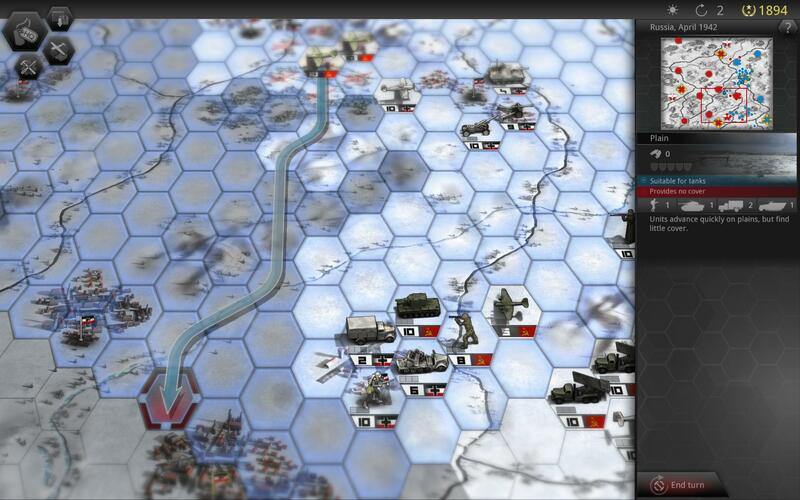 I can easily recommend this game to any WWII fiend or fan of planning intensive strategy games. The Talos Principle Public Test, Try It!